What's the harm in putting off replacing my engine air filter a little longer? That's a fair question from Gainesville drivers because the harm takes a while to manifest. Let's take a small step back and talk about what an engine air filter does. The air all around us contains dust, dirt, pollen, spores, etc. Some areas and times of the year have more contaminants in the air. The job of the air filter is to keep that stuff out of your engine. The benefit to Gainesville drivers is obvious. 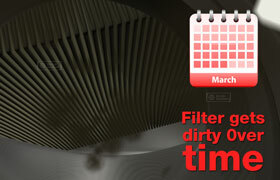 Now your engine uses a lot of air – like 12,000 times the volume of air as fuel – so the engine air filter has job to do. When the filter gets full and can't hold any more dirt, all that air still has to get to the engine so dirt gets forced through the filter and heads on downstream. A primary cause of catalytic converter failure is improper engine management, often triggered by a dirty MAF sensor which was contaminated because the engine air filter had not been replaced as recommended. Now Gainesville drivers can buy several cases of engine air filters for what it would cost to replace a catalytic converter. So when it's time to replace your engine filter, keep in mind the potential long term effects of putting it off. Talk to your friendly and knowledgeable Jerry's A/C & Auto Repair service advisor.